Bad weather curbed business activity growth in March, leading to the weakest expansions of output and new orders for 20 months. Jobs growth also slipped to a one-year low. 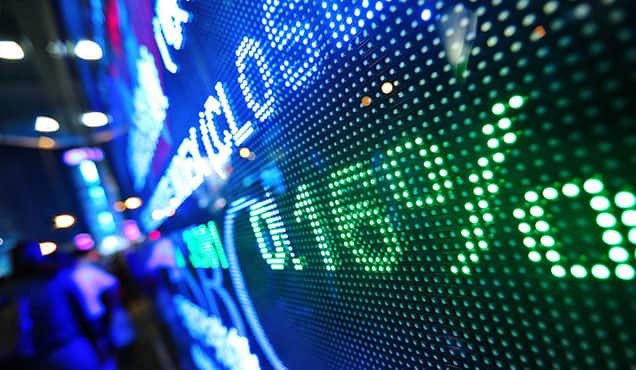 However, while some rebound is expected in April amid better weather, a deterioration in business expectations suggests the underlying trend remains one of weak growth compared to that seen late last year. Price pressures meanwhile remained stubbornly high as input cost inflation picked up again. 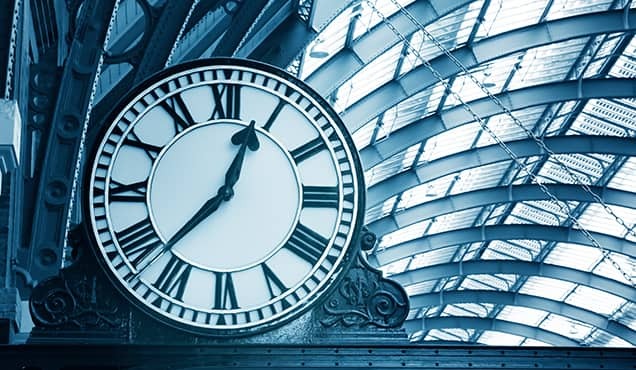 With parts of the country hit by some of the heaviest snowfall in years, it was not surprising to see UK business activity disrupted in March. 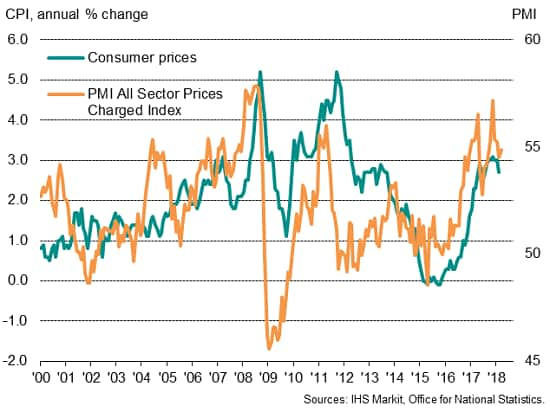 The ‘all-sector’ IHS Markit/CIPS PMI Output Index fell from 54.2 in February to 52.1, its lowest since July 2016, a time when business was hit by the surprise Brexit vote in the EU referendum. At 53.1, down from 54.9 in the fourth quarter, the average PMI reading for the first quarter as a whole signals a GDP growth rate of just under 0.3%, albeit with the rate of expansion sliding to just 0.15% in March alone. The 2.1 index point fall in the all-sector PMI between February and March is comparable to prior years in which the country saw heavy snow. In January 2010 and December 2010, the PMI fell by 1.9 and 2.8 points respectively. However, in both cases, the decline was more than reversed in the following month (regaining 3.0 and 4.2 points respectively). 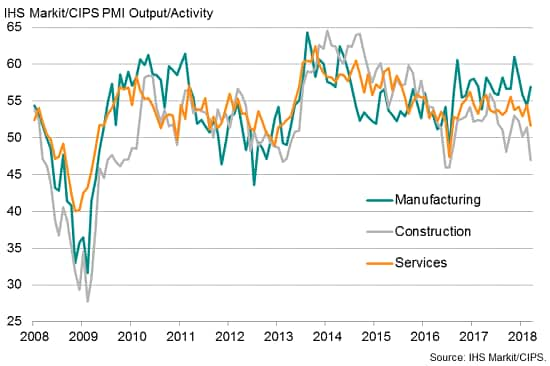 Although the latest data showed manufacturing enjoying the strongest rise in output for three months, suggesting little negative impact on factory production from the adverse weather, construction activity fell at the steepest rate since July 2016 and service sector activity growth also struck a 20-month low amid widespread reports of snow-related disruptions. 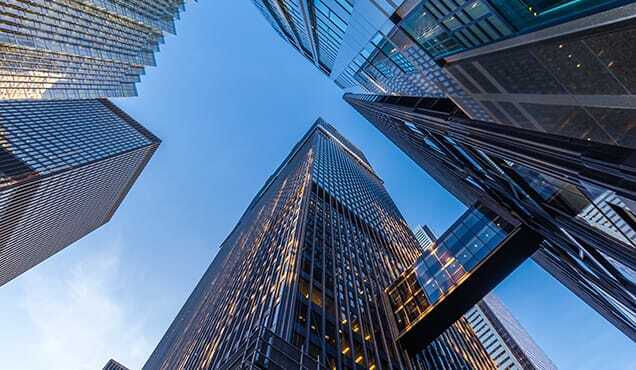 In the service sector, the weakest performances were seen within hotels and restaurants and other consumer-facing activities, followed by transport and communication services. 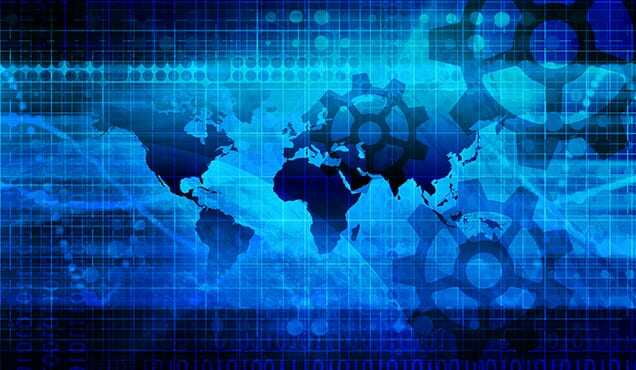 The vast business-to-business services sector has also seen growth trend lower in recent months. Trends in new business meanwhile deteriorated in all three major sectors of the economy in March. The weakest increases in new orders for 20 months in both manufacturing and service sectors were accompanied by a third consecutive monthly decline in new work within the construction sector. Measured overall, the increase in new work across the three sectors was the smallest since July 2016. While slower growth of new orders would normally suggest output growth would weaken in the following month, experience from previous periods of adverse weather suggests order book growth could also rebound in April. The survey data also showed private sector employment growth slipping to the lowest for a year. However, despite the March dip, the first quarter average all-sector Employment Index is slightly above that seen in the fourth quarter, with payroll numbers still rising in all three sectors to suggest that companies are, on balance, still expanding capacity. 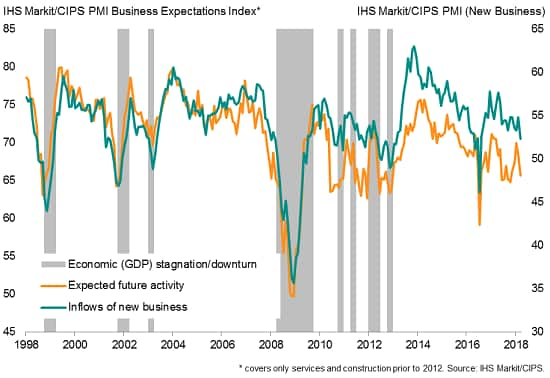 Perhaps more worrying was a drop in business expectations about the year ahead during March, boding ill for the underlying trend in output and order book growth. Optimism about activity levels in a year’s time fell to a five-month low, fueled by lower sentiment in the service sector. Inflationary pressures meanwhile picked up again in March. 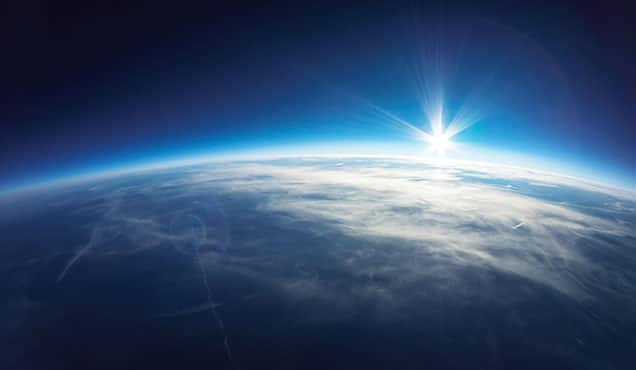 Although remaining below the peaks seen late last year, rates of both input price and selling price inflation remained elevated by historical standards, suggesting consumer price inflation could stay stubbornly high in coming months. 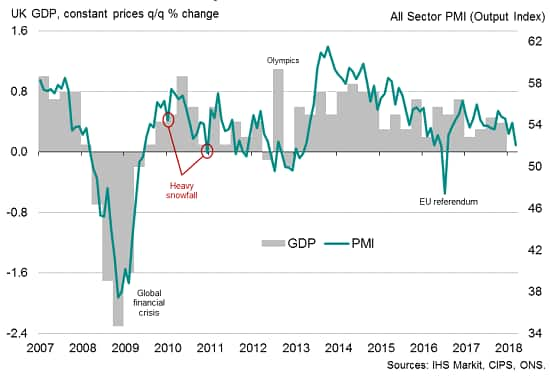 Given the heavy snowfall seen during the month, the March drop in the PMI is likely to do little to change policymakers’ views of the underlying health of the economy. 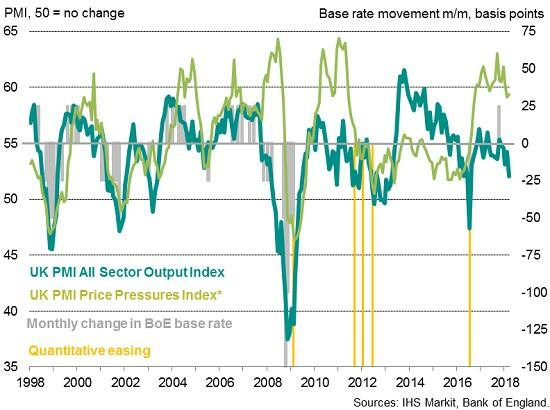 The indications of solid employment growth, which may add to growing wage pressures, and high price pressures therefore leave a widely-touted May rate hike very much in play. Two of the Bank of England’s nine Monetary Policy Committee members have already voted for higher interest rates, adding to expectations that the Bank’s policy rate will rise to 0.75% in May, alongside the Bank’s updated growth and inflation projections. 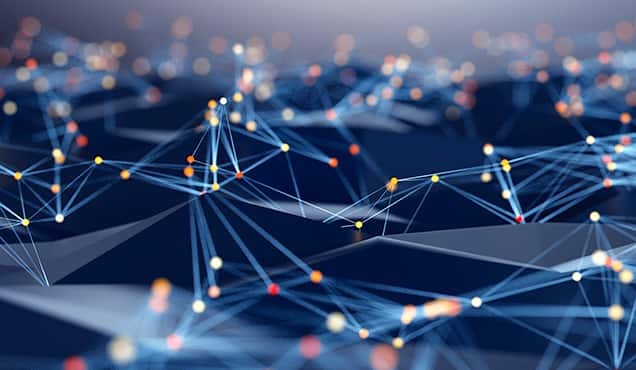 By then, April PMI data will be available to policymakers, which will provide a clearer indication of the economy’s growth trend.